Before Laptops and External Hard Drives existed, We all used to have that old Desktop PC with Internal 3.5" inch Hard Drives (PATA / SATA). Many people have moved to Laptops and quit using Desktop PC but they still have DATA in their PC Hard Drives. So What to do? Either you can transfer all that data using External Hard Drives or USB pen drives to your new laptops / device or Why Not convert your old 3.5"inch Internal Hard Drive to External USB Drive? I mean Why not turn your Internal PC Hard Drive to an External USB Drive, Yes it is possible but you'll have to invest a small amount, but the best point is that you'll get an extra storage device which you can keep handy for data transfers or for storage. In this post I will explain How you can do it. I used to have an Old Computer at home which I used during my childhood days. After years of using, the computer eventually died and since I was having a personal laptop, I didn't repaired it. The computer was kept dead in my room and was just a show piece. But the Hard Drive of the computer was having my valuable a data which I couldn't afford to lose. So I tried to figure out a way to extract that data from the Internal Hard Drive. Everybody knows that we cannot connect Internal Hard Drives to laptops, So how to get my data? I researched online and at local computer peripherals store to get solution, I came across a casing device which actually converts Internal Hard Drives to External ones and give you easy plug and play feature, So you'll have to buy the casing device according to the hard drive you have. Hard Drives are of two types and two sizes. So to convert your Hard drive to external drive, you'll have to buy casing which supports your hard drive. In the above Image, The left one is 3.5" inch Hard Drive and Right one is 2.5" Inch Hard Drive. 3.5" inch Hard drives require more power than 2.5" inch Hard drives, So you'll have to make sure what drive you have. If the Hard Drive is from your Desktop PC then most probably it is 3.5" inch and if it is from old laptop then its 2.5" inch. If you are still not sure then measure it. Hard Drives are rectangular in shape, measure the smaller side (breadth) of the drive. Note: 2.5" inch Hard Drive casing is usually USB powered which means that it takes power from the USB port it is connected to. However 3.5" inch Hard Drive casing requires external power, which means you can only use 3.5" inch Hard drive if external power source is available, It comes with power adapter which has to be connected before using. Since 3.5" inch Hard Drive requires more power than 2.5" inch drives, you cannot make it portable. There are two types of Hard Drives used in PC's. 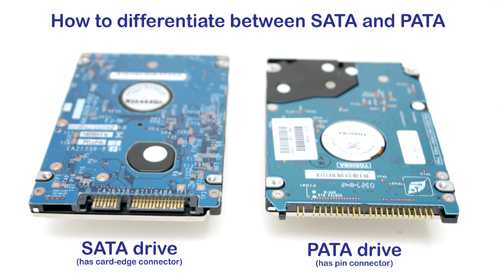 One is called PATA which is found mostly in old computers, the other one is SATA. You can identify Hard drive type by looking at the connector. PATA Hard Drive - Metal Pin Connector. SATA Hard Drive - Flat Tab Connector. Once you know your hard drive type and size, You can buy the casing according to it. 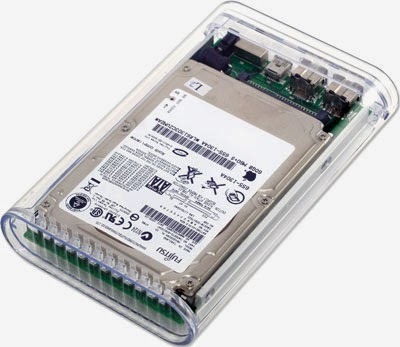 You can buy Hard Drive casing online or from nearest computer hardware store. They are easily available and does not cost much, I bought one for less than $15 (Rs.700). They are easily available at eBay, below are some links for buying online. If you still can't find suitable casing for your hard drive then simply search on Google for relevant results or just visit local computer hardware store and I'm sure you'll find it there. Installing Internal Hard Drive inside casing is super easy, All you need is a screw driver. Most of the casing requires you to open a couple of screws, connect your hard drive to the casing and fixing it there. Read the Instruction manual for fixing or simply search YouTube for Tutorial videos. Once you've connected your Hard Drive into casing, you can simply connect it to your computer and extract your data. Now its is portable (or semi portable in case of 3.5" inch drive). Still you can carry it with you and store your data. I hope this article was helpful. Please leave your comments below and do like us on Facebook or follow us on twitter for updates on new articles.